Home Care in Lake Forest CA: Why Does Driving Become Difficult? Why Does Driving Become Difficult for Your Aging Adult? So many aging adults start to experience trouble driving. It can be disconcerting for them and for you, especially if you weren’t ready for these types of changes in your elderly family member’s life. Understanding why driving can become difficult for her can help you to spot some of these situations for your aging family member. Home Care in Lake Forest CA: Why Does Driving Become Difficult for Your Aging Adult? Your elderly family member’s brain might seem like one of the few things that doesn’t change as she ages, but it does. She may start to have memory trouble or start to make questionable decisions. Sometimes this is related to an illness, such as Alzheimer’s disease, but other times it’s simply something that happens as she grows older. Her doctor can help you to determine what exactly is going on with your aging adult’s brain. Your senior might start to lose muscle tone or strength, which is a big problem when it comes to driving. 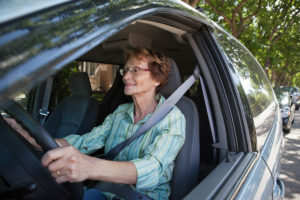 Your elderly family member needs to be able to look over her shoulder, physically handle controlling the car, and have the physical strength to press the brake and gas pedals. If that’s becoming difficult for her, then driving may have to end. As vision and hearing change, they can affect so much about how your elderly family member experiences the world. And when it comes to driving, she may not be experiencing as much as she thinks that she is. Make sure that you get your senior’s hearing and vision checked yearly at the very least. This helps you to keep up with the changes she may not be noticing. She Becomes Afraid of Driving. In some cases, your elderly family member may simply become afraid of the act of driving. When that happens, she may make decisions too slowly or not at all. She may engage in behaviors behind the wheel that put herself and other people in danger. This fear can create big problems for her as she drives and may mean that your senior is better off deciding not to drive at all. If driving is now dangerous for your elderly family member or she simply doesn’t want to drive anymore, there are options for her. Home care providers can take over the driving for your aging adult, leaving her in the safe hands of people who are there to help her. You’ll also feel a lot more secure knowing that your senior is no longer on the road.